Please note that above price is subjected to change and is for reference purpose only. Kindly contact Nissan Nepal to get the latest showroom price. Note: Nissan car price list was last updated on February 21, 2019. Nissan cars in Nepal are distributed by Pioneer Motocorp Private Limited. In the past they were distributed by Dugar Brothers & Sons. However recently in 2017, Pioneer Motocorp were selected as official distributor of Nissan vehicles for Nepal. Nissan cars were in Nepal since 1972 under Motilal Dugar, the then chairman of Dugar group. Dugar group was able to introduce new concepts in Automobile industry of Nepal through its highly dedicated and trained professionals. But as of today, both Datsun and Nissan, which belong to same manufacturing company, are sold through Pioneer Motocorp. Talking as global brand, Nissan cars are product of Japanese multinational company i.e. Nissan Motor Company Limited. It’s headquarter is in Nishi-ku, Yokohama. It sells brands like Nissan, Infiniti and Datsun. Among these brands, Infiniti cars are yet to officially enter in Nepal. Nissan and Datsun are already making a presence. It is part of Nissan-Renault-Mitsubishi Alliance where they hold share of each other. Though the manufacturing company of Nissan came in 1911, brand was born in 1930s. Since then, Nissan has evolved as a strong brand over the course of time. In 2014, it was the largest car manufacturer in North America. Currently, Nissan is the largest manufacturer of Electric Vehicles (EV) world-wide, with Nissan Leaf being their top selling electric car. Talking about models of Nissan cars available in Nepal, currently it is selling 6 models and its variants. 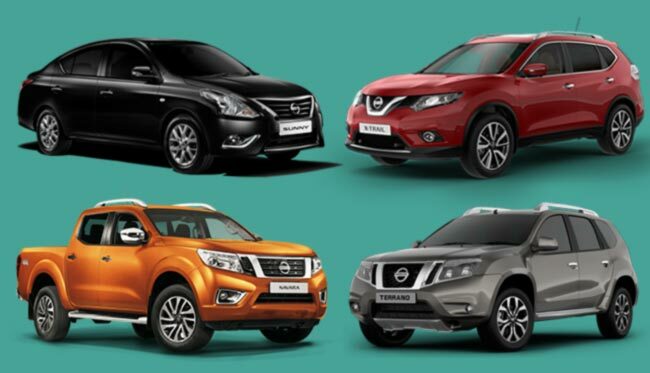 These models include Sunny, Navara, Terrano, X-Trail, Kicks and Micra Active. Nissan car starts at the from price range of Rs. 26.99 lakhs in Nepal and goes up to Rs. 1.3 crore, as listed above, which makes it affordable vehicle. Or you can message us your queries regarding Nissan car price in Nepal or its specifications at our Facebook page.